(Newser) – Fingerprinting is an "old-fashioned technique," says Dave Thomas of the South Wales police. Convicting a drug dealer on the basis of a partial fingerprint from a photo in a WhatsApp message, however, is groundbreaking stuff. The image of a hand holding ecstasy pills was the key evidence in a case that sent 11 members of a drug gang to prison. Thomas says that amid a stream of messages on the phone of a suspect, there was a "photograph of the hand holding pills that seemed like it was sent to potential customers saying 'these are my wares, I'm selling these,'" the BBC reports. It proves he's a guy with colorful objects in his hand maybe. That's great... just go around announcing it to the world so they know better than to allow their hands in the photos. SMH ;) Also, didn't know there were still pressies! 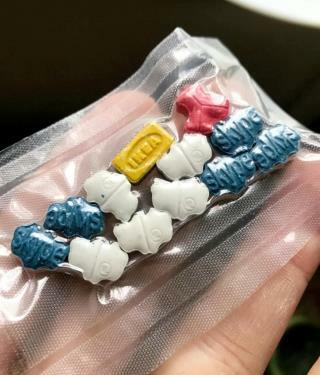 It's been nothing but powder molly in my area for over 10 years.. can't get those anymore. Used to come out of Toronto. Never liked E like all my friends did... made me nauseous and depressed due to killing all my seratonin. Yes, I used to be a complete dummy. Now, No thanks.